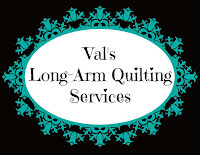 Val's Quilting Studio : Free Quilting! What!? It's not to late to get your number in the hat to win free quilting on one of your baby or lap size quilts! As one of the many sponsors of this year's H2H Charity Quilt Challenge at Sarah's blog, I'm offered to quilt one of those size quilts with an edge to edge panotgraph, along with free return shipping, for one lucky pariticipant of this year's charity event! examples of my long-arm quilting by clicking right HERE. I know many of us have already signed up to donate a quilty hug...or two...or three! But if you haven't, checkout the details of this event by clicking right HERE and hopefully you'll join us in spreading some quilty love. Speaking of getting going...time for me to get started on getting my own donation quilt finished too! See ya tomorrow for Tuesday Archives: Photo Quilts. Val you are so wonderful to do that! I saw your prize when Sarah started posting her list and thought it was really great of you! Thanks for the shout-out, Val! And for the awesome prize!! I think this just an awesome contribution to H2H - thank you. I'm looking forward to seeing who will win! It will be fun! Thanks for your kind comments. You are good peeps, Val. That is an awesome prize. I hope I win it! You bet!! I'm so glad you will be joining the challenge this year.